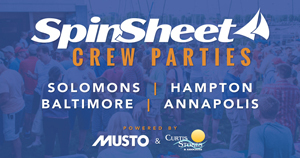 J/70s, Oxford, AYC vs. San Francisco YC, and more... Here’s your SpinSheet racing roundup for the weekend of August 26-27 on the Chesapeake. 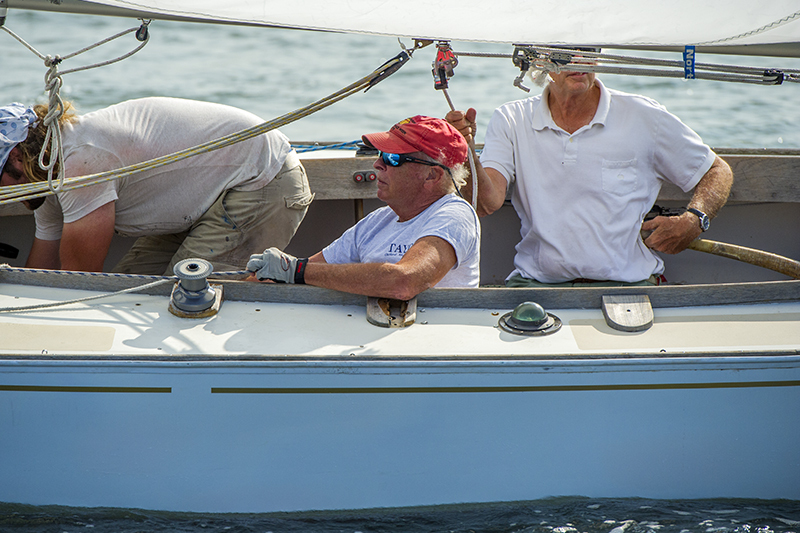 As usual, there was a lot of racing action out of Severn Sailing Association in Annapolis. Fourteen J/70 teams enjoyed the weekend's outstanding sunny and cooler conditions to complete seven races for the Severn Sailing Association (SSA) Mid-Summer regatta. Winds ranged from eight to 12 kts from E/NE over the weekend presenting an ever changing race course that required teams to quickly shift gears and be keenly focused to stay in the pressure and big shifts and avoid the powerboat chop over Saturday and Sunday. The fleet included a few new J/70 Fleet One boats and some very talented high school sailors amongst the teams. 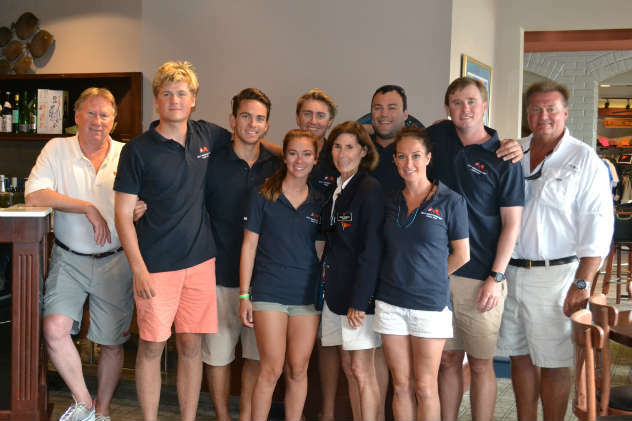 Bill Vickers' team, which included top high school laser sailor Leo Boucher, took 5th; Henry Filter's Team Wild Child who used this as a team training opportunity for the upcoming J/70 Worlds in Porto Cervo, Italy, sailed to a solid 4th; Dave Schone's Uno Mas team posted a series of consistent finishes to take third. Todd Jenner/ Mike McNamara won 3 races with their Tea Dance Snake team to finish second. 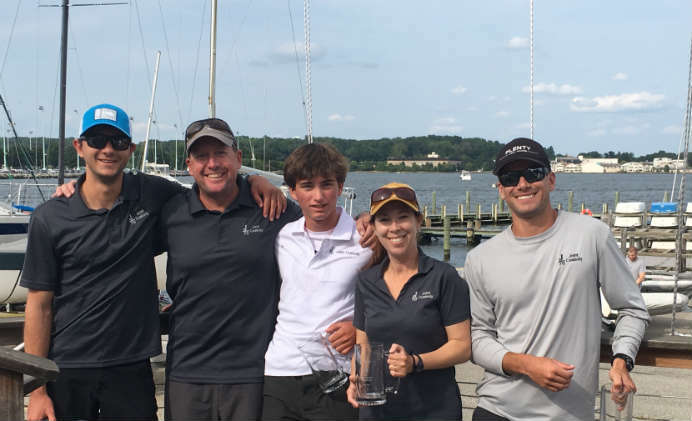 Team Joint Custody with Jenn Wulff, Ray Wulff, Fletcher Sims, Brady Stagg, and stand out high school sailor Mariner Fagan won the seven-race series with three 1sts and a total of 16 pts for the weekend. J/70 teams enjoyed a great fleet BBQ at SSA Saturday night. Find full J/70 Mid-Summer Invitational results here. Speaking of J/70s, entries are trickling into the J/70 East Coast Championships at Fishing Bay Yacht Club September 29-31. It’s the same weekend as Annapolis YC’s Fall Series, so Annapolis sailors have decisions to make. Looks like Henry Filter, Allan Terhune, and Blakely Kimbrough are headed south! Find registration information and entry list at this YachtScoring link. 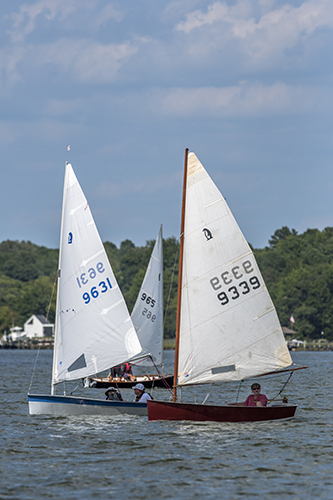 AYC match raced with SFYC last weekend off Annapolis on J/22s for a Corinthian Cup, with adult and youth teams. AYC proved victorious in the event. Find Corinthian Cup Results here. 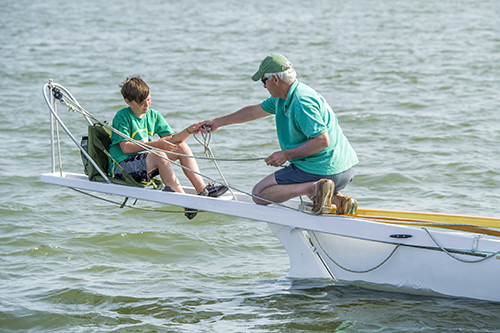 Shields, Penguins, and log canoes raced out of the Tred Avon Yacht Club last weekend. Find the full Heritage regatta results on TAYC’s website here. CCV Founders Race. 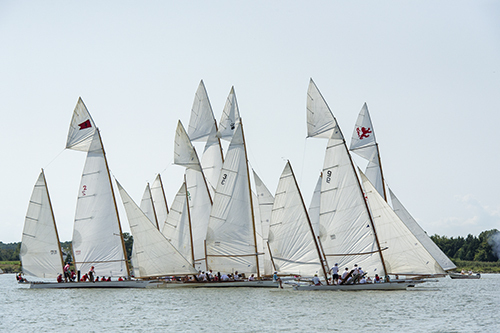 On Saturday twenty-one boats raced off Ocean View in the CCV Founders Race. The course was a windward-leeward format with total distances for each fleet according to number of legs. PHRF A (5 boats): 1.Phil Briggs, Feather; 2.Neil and Lis Biondi Ford, Danger Paws; 3.Leroi Lissenden, Voodoo 2. PHRF B (5 boats): 1.Ben Weeks and Michele Cochran, Rumble; 2.Rusty Burshell, Cool Change; 3.Bob Archer, Bad Habit. PHRF C (5 boats): 1.Alan Bomar, Roundabout; 2.Ben Cuker, Callinectes; 3.Jeff Rogers, Halaha. PHRF Non-Spin (6 boats): 1.Jake Brodersen, Midnight Mistress; 2.Dixon Wilde, Kingfisher; 3.Ken Copeland, Black Widow. One boat, Luna Blu, Midgette, sailed the course as a Cruiser. HYC Single Hand Race - Neil Ford in his Melges 24, Danger Paws, bested the group of 4 singlehanders in this annual Hampton YC race held Sunday. Ben Cuker, Callinectes was 2nd and Alan Bomar, Roundabout, was 3rd. Sailing was in Hampton Roads Harbor. Principal Race Officer was Michelle Garn and Leanne Cranfill was scorer. 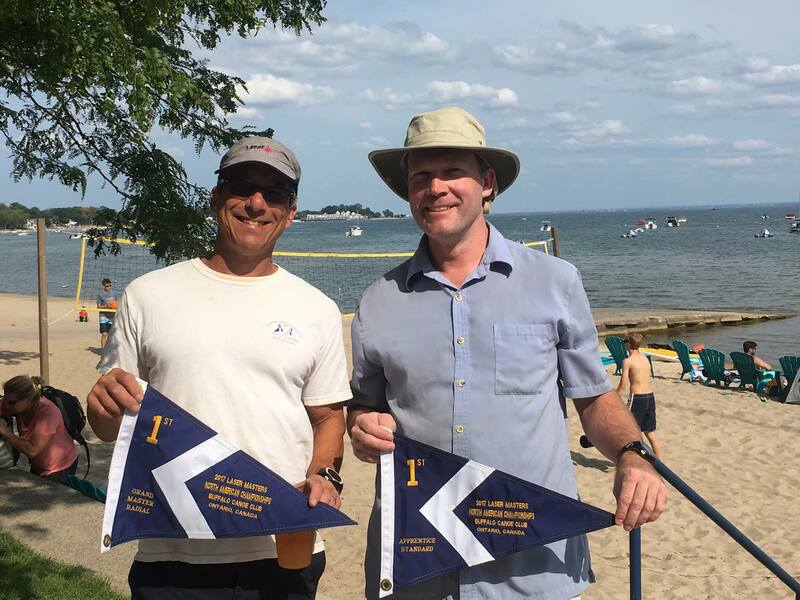 Severn Sailing Association members Bob Tan and Luke Shingledecker topped their classes at the Laser Masters North American Championships in Ontario, Canada, last weekend. Other podium finishes by Chesapeake sailors included Scott Williamson, Kim Couranz, Dorian Haldeman, and Jacques Kerrest. Find full Laser Masters National results by division here. Nice article in the Capital about Cedric Lewis, Chip Carr, Greg Larcher, and John Meiser at the Hospice Cup Championship in New York. How do I get my club's race into the weekly SpinSheet racing roundup? Easy! Send us news anytime.. it always helps if it comes with a photo... it also helps if you send us news by 9 a.m. on Monday! Thanks!